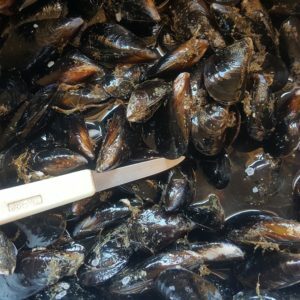 In South Africa, wild mussels are abundant and easily accessible on the rocky platforms of the Cape West Coast and Saldanha Bay is considered a prime site for the culture of the blue mussel, or Mediterranean mussel, Mytilus galloprovincialis. The bay is fed by pulses of cold, nutrient-rich water that moves in from the south, driven by strong offshore winds. This cold water provides an ideal environment for the growth of plankton, a natural feed for cultured mussels. Mussels are grown on ropes suspended from longlines in the sheltered, yet well circulated environment of Saldanha Bay. Mussels are sold in fresh and frozen form.